Moro campground is located at Crystal Cove State Park, just north of Laguna Beach on Pacific Coast Highway and offers spectacular sunset views over the Pacific ocean. The campground has 59 family campsites on a terraced hillside overlooking the Pacific Ocean. There are 29 campsites with electric hookups (for trailers and RVs), and also 30 others (no hookups) for tents, trailers and RVs. Each campsite has a picnic table. The campground has drinking water, an RV dump station, showers, campfire center and flush toilets. No wood/charcoal fires (BBQ) and gas fireplace fires are allow. Only free-standing tents are allowed (no stakes). Each campsite is allowed one vehicle and one towed vehicle. You can have up to 8 people per campsite. You can also put up to two tents per campsite if there is room. Pets are okay, but must be on a leash. There are also 3 primitive campgrounds available including Deer Canyon, Upper Moro and Lower Moro. Reservations are required and you can click on the ‘Make A Reservation’ button to check availability/make a reservation. All three campgrounds require at least a 3 mile hike and you must bring all gear including water, food, tent, etc. Only backpack stoves are allowed to cook food. 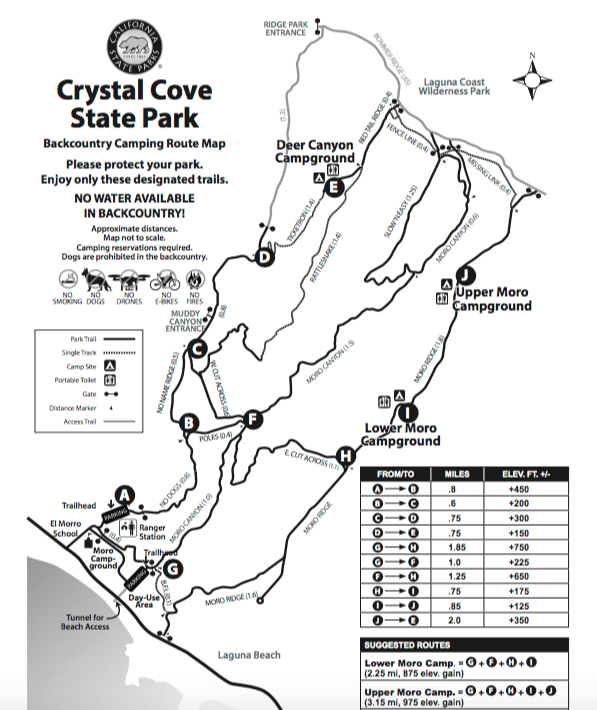 Click HERE to view the Crystal Cove Backcountry Camping Route map. Parking is available at the trailhead. Below the campground is a day use area with beach access. The day use area has picnic tables, an outdoor nature center, showers and drinking water. Also don’t forget to check out the Crystal Cove State Beach Cottages and historic area! Bolsa Chica State Beach is another option about 16 miles north on Pacific Coast Highway. It has 60 campsites with electric/water hookups for trailers and RVs only. For RV's: 13 and 21; and for tenters: sites 51-60 (all with whitewater views). Visted Moro Campground lately? We'd love to hear about your adventure. Did you find us useful? Did we forget something? Anything our community should know before heading out to Moro? any where to camp in this area where you can have a campfire?? Moro campground does not permit wood or charcoal fires, but does allow compressed gas BBQs and outdoor fireplaces. The closest campgrounds that do allow wood/campfires would be San Clemente State Beachh and Doheny State Beach. You are correct in that no tent stakes are allowed at Moro campground (Crystal Cove State Park). Only free standing tents are allowed in the campground. The campground is located up on a hill, across the highway from the beach. Generally the wind is not a factor up there unless during a storm or when the Santa Ana winds are blow. In the summer – it is usually calm. As for securing your tent w/o stakes, I’d recommend bringing some exercise weights and putting those inside (in each corner). 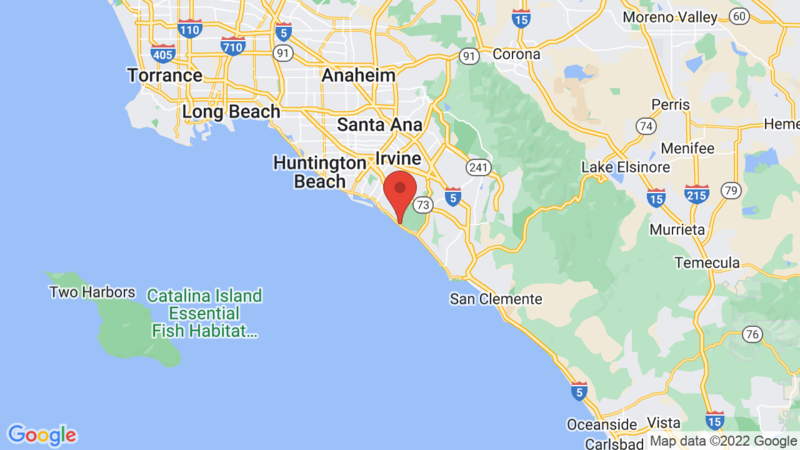 Is there anywhere in California that you are allowed to camp on the beach without a designated campsite? We would like to just find a spot and primitive camp for the night. A very good question. To our knowledge, there isn’t anywhere along the California beaches where you can camp on the beach/sand that is not a designated campsite. There are a few (campsites) at Gold Bluffs Beach where you can pitch a tent on the sand. I’ll post your question on the CampsitePhotos.com Facebook page. Check there and see if anyone responds. You can also post a question on the CampsitePhotos.com Forum and see if anyone has any ideas. Morro Strand has small tent areas along the beach side of what amounts to a former day use beach access parking lot. You are between a curb and a small sand dune. Do the tent sites have power? The tent campsites at Moro campground do not have electricity. Yes, those are allowed at Moro campground. CAN YOU PUT UP 2 TENTS IN MORO CAMPGROUND? If the site is large enough to accommodate 2 tents – then yes, you can put up two tents at Moro campground campsites. There is a maximum of two tents per site at Moro campground, and remember – no stakes allowed. Can you have a small tent in arc site? Also are there RV/trailer sites without hook ups? 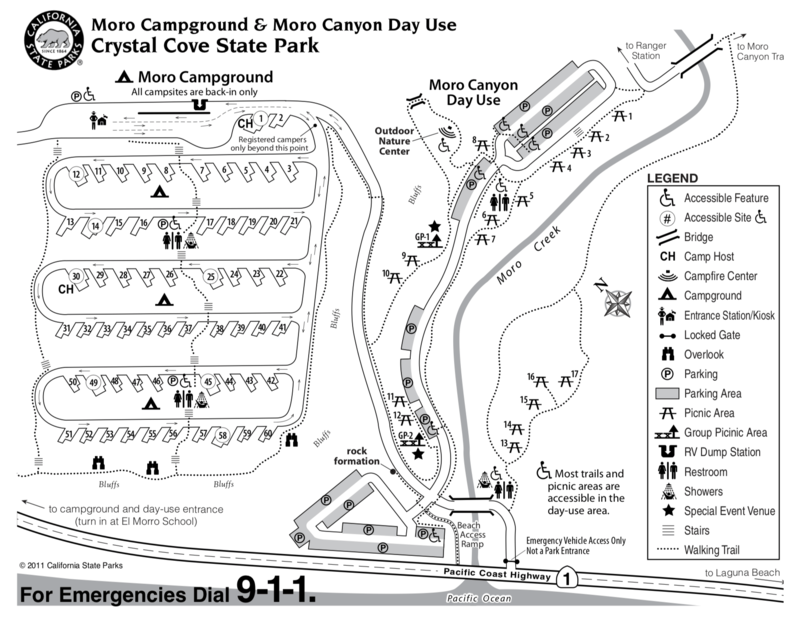 Moro campground at Crystal Cove State Park does have 30 sites w/o electricity and these can accommodate tents, trailers and RVs. The ‘trailer/RV’ sites have hookups and a pad for a tent. We are coming to visit from Nebraska March 3rd through the 7th. We would like to set up tent but was wondering how cold it gets at night there. We have 3 kiddos and don’t wanna freeze em. We are from Nebraska though so we can handle it a bit colder. It’s -14 hear right now!! Sounds like you’re going to have a nice vacation! Typically (in early March) the weather at Moro Campground / Southern California will be in the low to mid 70s during the day and mid to high 50s during the night. With that said, Southern California has been receiving more storms/rain this year so check the weather forecast for Laguna Beach, CA. HI, I have site #16 and am a little concerned being so close to the bathrooms. Can I have a realistic big picture of what to expect? We have two young children so we are a little worried about all the extra foot traffic? Any smells? Is Old Moro Campground still accessible via hiking/backpacking? And if so, how does one reserve a spot there? There are also 3 primitive campgrounds available including Deer Canyon, Upper Moro and Lower Moro. Reservations are required and you can click on the ‘Make A Reservation’ button to check availability/make a reservation. All three campgrounds require at least a 3 mile hike and you must bring all gear including water, food, tent, etc. Only backpack stoves are allowed to cook food. Parking is available at the trailhead. FYI we hope to get photos of each campsite in the next few weeks. We have a small travel trailer(only 12 feet) and will be in site #29. May we have a large tent as well st this site? We should have plenty of room. Thanks! Yes, you can have a tent at Moro campsite 29, as long as everything fits within your campsite. Have a great time!